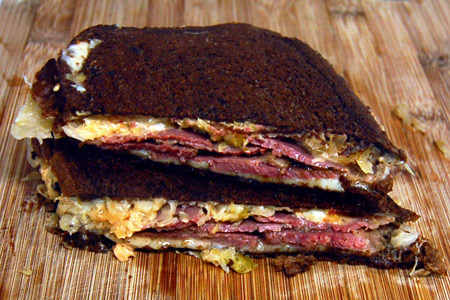 Homemade pastrami is something that has been on my barbecue bucket list for a long time. Even this cheater version turned out better than I expected, and I'd be hard-pressed to go back to the standard grocery store version. This is a cheater version because I started with store-bought corned beef, as opposed to corning the brisket myself. I'll try the "real" version sometime, but for now this at least gives me a baseline for comparison when I do. This might look like a lot of work for a "cheater" approach, but it's really pretty straightforward. Here, let me show you. Combine the mustard, brown sugar, coriander and allspice in a small mixing bowl and whisk until the sugar is dissolved. Remove the corned beef from the package, rinse very well under cold running water, then pat dry with paper towels. Coat all sides of the corned beef with the mustard mixture then coat it completely and evenly with the pepper. Place in a lipped non-reactive pan, cover with plastic wrap and refrigerate overnight. Note: Some folks recommend soaking the corned beef in water for about 24 hours, changing the water a few times. I decided to skip that step this time, so I don't know how that might have affected the final product. Remove the corned beef from the refrigerator about an hour before you're ready to start cooking. 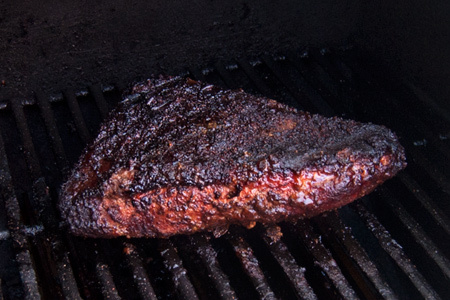 Start your smoker and prepare for indirect cooking at medium heat (300-325º). About 15 minutes before you're ready to start smoking add three medium-sized chunks of smoke wood to the fire. I used 2/3 cherry and 1/3 hickory. 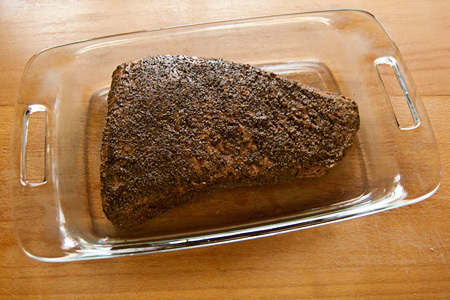 Cook the corned beef indirect until it reaches 175º in the center of the thickest part (about 2-3 hours). 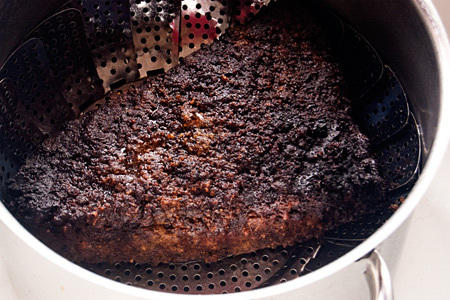 Move the pastrami to a steamer rack in a large non-reactive stock pot with about 3 cups of water. Bring to a boil, cover, and steam over medium heat until the center of the thickest part reaches 195º (about 30 minutes). Move the pastrami to a lipped pan, cover with plastic wrap, and let cool. Slice thin, pile it on some good dark rye smeared with mustard, add a couple slices of Swiss cheese and warm until the cheese just starts to melt. I nearly attempted this for St. Patty's Day but couldn't find a good recipe - looks like now I have one - thanks! Oh goodness - I'm totally making this for the weekend! I've only ever done the cheater version, it was good so I haven't bothered corning the beef myself. I do like to soak mine as you mentioned, helps cut down on the salt. 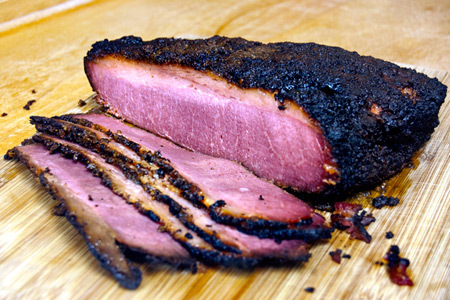 If you have leftovers, try out The Blue Max (http://www.nibblemethis.com/2011/03/smoked-pastrami-blue-max.html). It was a favorite pastrami sandwich from a place in Jacksonville. I love "cheater" recipes. I've found that many times, if you follow a "cheater" recipe from the various BBQ blogs and forums (VirtualWeberBullet.com), you end up with just as good a piece of meat as doing it the hard way. With so many corned beef brisket leftovers from St Patty's Day in the local grocer, I just may have to try this. I do love me the pastrami too! Will be trying this out this week! Cant wait.